(Allium ursinum) also known as Ramsons, buckrams, wild garlic, broad-leaved garlic, wood garlic or bear's garlic is a wild relative of chives. The specific name derives from the fact that brown bears like to eat the bulbs of the plant and dig up the ground to get at them, as do wild boar. Garlic leaves are edible and much mentioned by media chefs at the moment; milder than normal garlic, the leaves can be used as salad, spice, liquidised in soups, or as an ingredient for pesto in lieu of basil. 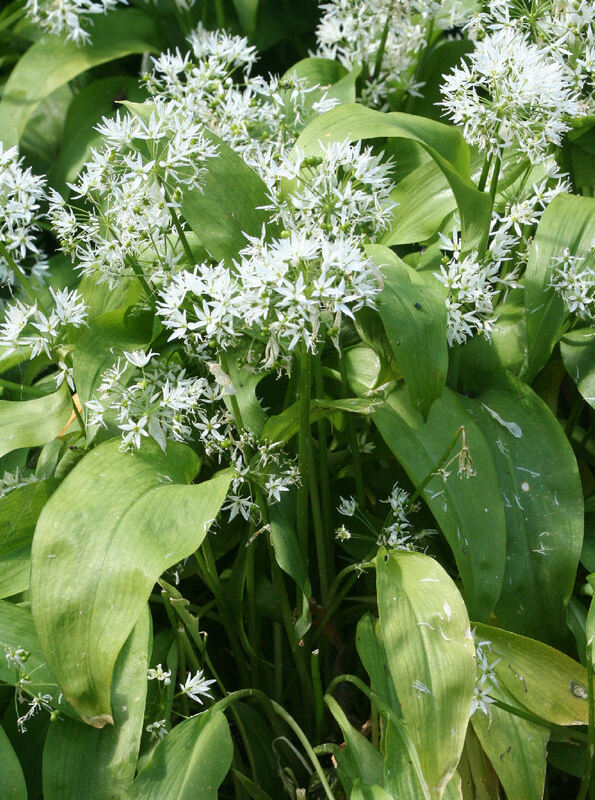 Ramsons grow mainly in swampy deciduous woodlands, being most common in areas with slightly acidic soils. They flower before the trees get their leaves and fill the air with their characteristic strong smell. The stem is triangular in shape and the leaves are similar to those of the Lily of the Valley. 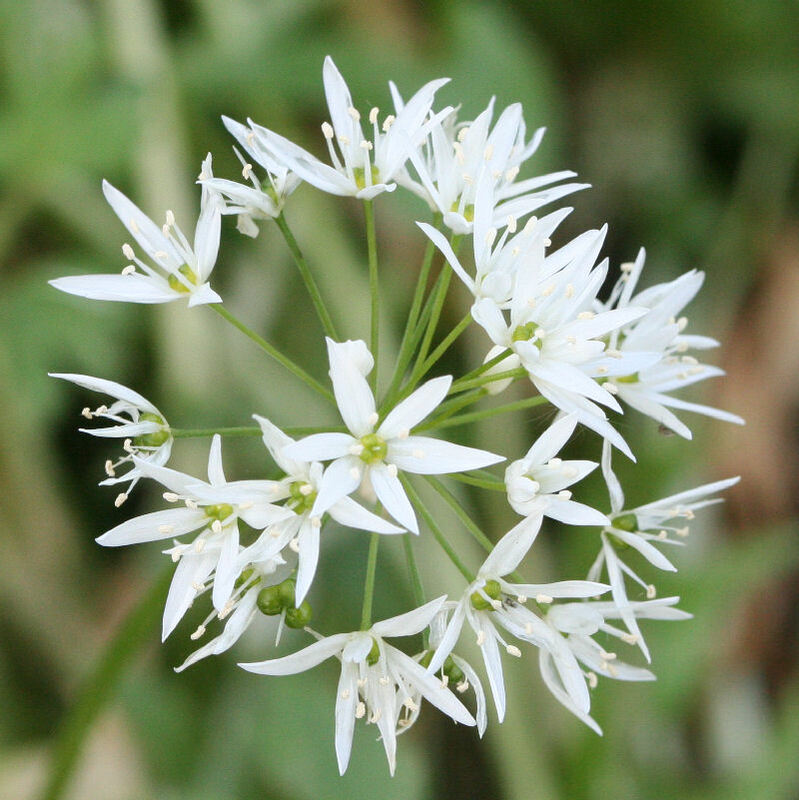 Unlike the related crow garlic and field garlic, the flower-head contains no bulbils, only flowers. They can become invasive. Garlic leaves are easily mistaken for Lily of the Valley leaves, and sometimes also with the leaves of Colchicum autumnale and Arum maculatum. All these three plants are poisonous and may even be deadly. A good way of ensuring that the leaves collected are in fact ramsons is grinding the leaves between one's fingers, which should produce a garlic-like smell. Garlic leaves can be used as fodder as well. Cows that have fed on ramsons give milk that slightly tastes of garlic, and butter made from this milk used to be very popular in 19th century Switzerland. 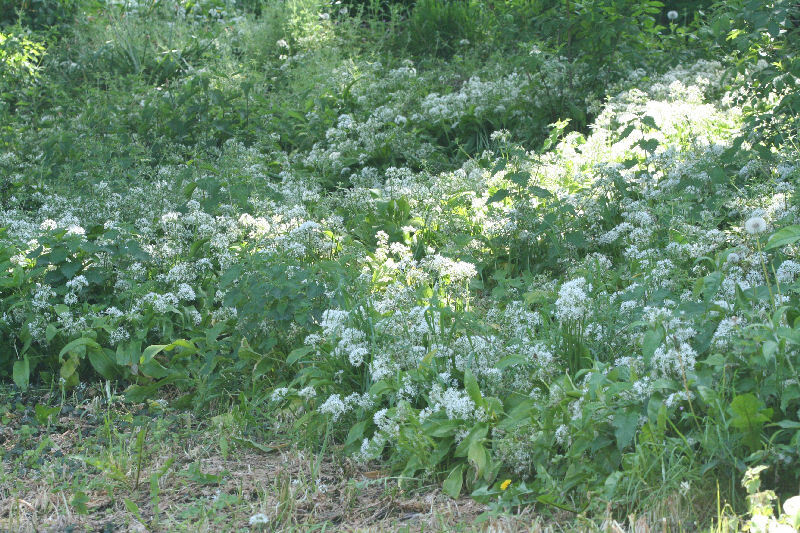 Ramsons (German: Bärlauch, i.e. 'bear's leek') have recently become very popular in German cuisine again. The town of Eberbach hosts an annual ramsons fair in March and April. Supplied as a bag of 5 fresh bulbs with roots and leaves, ready to plant.